The general interest of our lab is to understand the function of the proteasome, a giant molecular machine that has the capacity to destroy nearly every protein in the cell. Despite this destructive capability the proteasome is highly selective in what it chooses to destroy. In fact, this machine is so selective and precise that it can degrade a single subunit out of a protein complex with surgical precision, or can amputate a single domain from an isolated protein. Ultimately, our lab is interested in understanding how the proteasome moves and functions at a molecular level, using an energy dependent multistep process involving 1) substrate binding, 2) unfolding, 3) translocation, 4) gate-opening and 5) destruction inside of a sequestered chamber. More specifically we have a special interest in understanding how the many different regulatory “caps” that bind to the 20S proteasome catalyze aspects of this multistep process. Because of the proteasome’s central role in regulating most cellular processes (e.g. Cell cycle, Apoptosis, transcription, receptor signaling, etc.) understanding the mechanisms that regulate its specificity is not only of biological interest, but is also highly relevant to many areas of medicine (e.g. Cancer and Neurodegenerative disease). 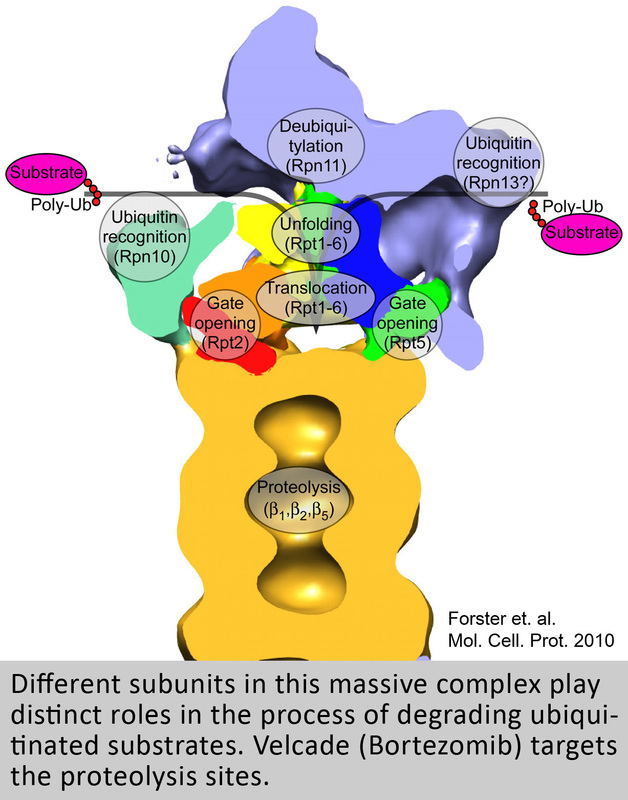 Animated model of how a ubiquitinated substrate is degraded by the 26S proteasome. The 19S binds to the 20S while hydrolyzing ATP. The ATPases C-terminal HbYX motif works like a key-in-a-lock to induce gate opening. A Ubiquitinated (orange) substrate (green) binds to the 19S. The substrate is unfolded and translocated through the opened gate. The substrate is degraded by protease sites inside the 20S chamber. Intact ubiquitin and small peptide products are released during this ATP-dependent process. Animation introducing the general structure of the 26S proteasome. The 26S proteasome is the primary site for targeted protein degradation in mammalian cells and it is essential. An inhibitor of the proteasome, Velcade (Bortezomib, PS341) is now a widely used drug for the treatment of hematological cancers and is currently in more than 300 clinical trials. Because of the unpleasant side effects and emergence of resistance in many patients, there is appreciable interest for the development of new more specific inhibitors. While, Velcade inhibits proteasome function generally—by targeting its proteolytic sites—the proteasome actually contains more attractive sites for drug development that could block protein breakdown in more specific and targeted ways. One of our goals is to understand how we might develop new types of proteasome inhibitors whose mechanism and properties would differ markedly from such proteasome inhibitors now used in the clinic. Several different types of proteasome regulatory complexes exist in mammalian cells that stimulate degradation of specific substrates. In addition, most of these complexes play important roles in cancer survival and progression, though their mechanisms are not understood. Our lab is interested in understanding how these cancer targets function to simulate protein degradation on a mechanistic level. These studies will hopefully lead us to a more general understanding of proteasome function in cancer, and in addition allow us to design new types of more specific proteasome inhibitors in the future. An important function of the proteasome is to degrade damaged or misfolded proteins in the cell. Most neurodegenerative diseases (e.g. Alzheimer’s, Huntington’s, Parkinson’s and Prion diseases) are characterized by accumulation of such neurotoxic proteins, and while causation for these diseases is elusive it is obvious that the cell’s only selective degradation machinery, the proteasome, must play an important role in their development. 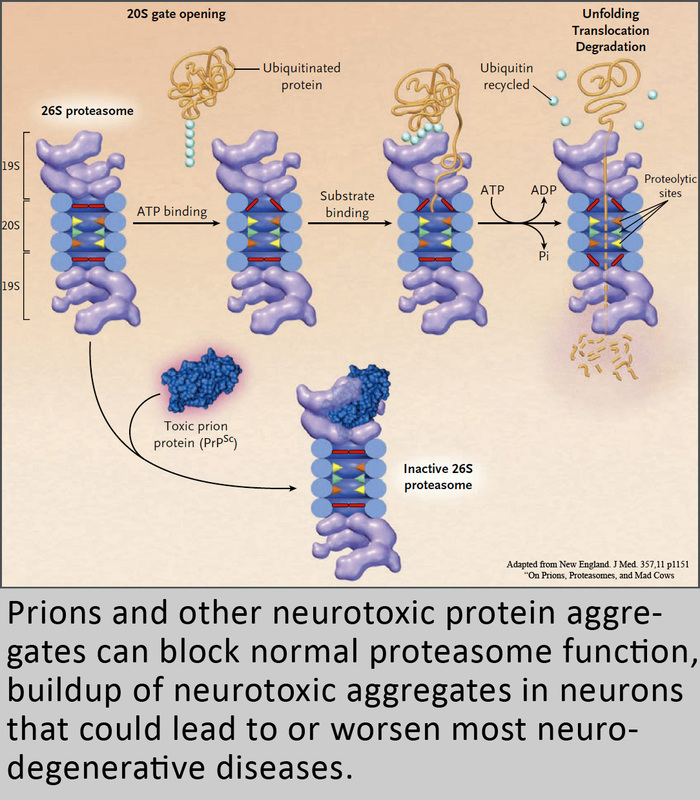 In fact it has been observed by many groups that such neurotoxic aggregates can negatively impact the ubiquitin-proteasome system. We are therefore trying to understand how toxic oligomers may inhibit or impair proteasome function, which could allow for a better understanding of the general mechanisms of these diseases and could lay the basis for future efforts to stimulate or restore proteasome function. Any opportunity to increase the functional capacity of the proteasome in specific ways could offer significant therapeutic benefits. Therefore, another interest in our lab is to design activators of protein degradation that might stimulate the degradation of toxic proteins involved in such neurodegenerative diseases. In this lab students will have the opportunities to learn a variety of biochemical, biophysical, structural, pharmacological, computational, molecular, and cell biological techniques. These skills are valuable for understanding and investigating enzyme function, drugs discovery, and the cell biology of cancer and neurodegenerative disease. Please feel free to contact me to learn more about what we do in our lab. Snoberger, A., Brettrager, E & Smith DM (2018). "Conformational switching in the coiled-coil domains of a proteasomal ATPase regulates substrate processing." Nat Commun 9(1): 2374. DeVallance E, Branyan KW, Lemaster K, Olfert IM, Smith DM, Pistilli EE, Frisbee JC, Chantler PD. "Aortic dysfunction in metabolic syndrome mediated by perivascular adipose tissue TNFα- and NOX2-dependent pathway." Exp Physiol. 2018 Apr 1;103(4):590-603. doi: 10.1113/EP086818. Epub 2018 Feb 28. Snoberger A, Anderson RT, Smith DM "The Proteasomal ATPases Use a Slow but Highly Processive Strategy to Unfold Proteins." Front Mol Biosci. 2017 Apr 4;4:18. doi: 10.3389/fmolb.2017.00018. eCollection 2017.